Our Chinese teachers in Beijing are the heart and soul of LTL Mandarin School. Experienced, certified, qualified and incredibly motivated, it is our Mandarin instructors that really allow students to make the rapid language progress they do. We are very lucky at LTL Beijing to have such a stable, motivated and dedicated teaching team and it is mainly their hard work which has made LTL so successful in the last few years. When hiring our teachers we are very picky. We pay well and our teachers stay with us for a long time. It is not easy to join the LTL teaching team, however once you are in you usually stay for a very long time. All Chinese instructors at LTL hold a university degree in Teaching Chinese as a Foreign Language at least at the Bachelor level. A lot of our teachers additionally gained a Masters or Phd in Chinese language education or were specifically trained as pedagogues. We have very strict hiring criteria and before someone can apply as a teacher at LTL Beijing they are required to show extensive successful teaching experience at other institutions. Our teachers usually previously taught Mandarin as professors or university lecturer, were top performing instructors at other language schools in Beijing or worked as school teachers at Mandarin schools outside China. Many also became scholars in Teaching Mandarin as a Foreign Language – which in Mandarin is called 对外汉语 – regularly publish in academic journals and today train others in teaching Mandarin. Many people seem to think if you know a language you can teach that language. We whole heartedly disagree with this. Being a real teacher is a skill. Many would even say a calling that is very difficult to obtain. Being a successful teacher requires a lot of time and an exceptional personality. A real educator motivates a student every day, while demanding discipline when required, ensures a focus on the areas that matter and guides you to your aims in the fastest possible way. Choosing LTL where teachers are not only qualified to do this but also hold a good position that offers benefits like social insurance, regular training, maternity leave and much more. However, if your aim is to learn Mandarin, the time (and money) you save by simply getting there so much faster, is in our opinion more than worth it. Yes absolutely. 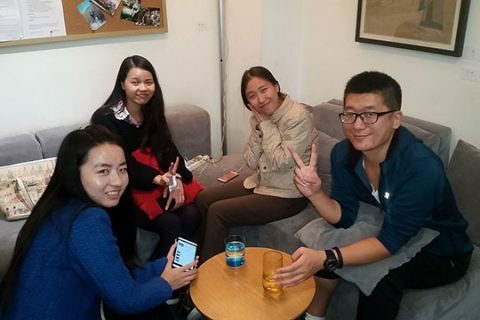 In our experience enjoying to learn Mandarin is the best way to progress quickly. This is why we find it important to make classes not only efficient but also fun. All Chinese teachers at LTL Beijing are native Chinese speakers who speak standard Mandarin. Most come from the Northeast of China – which includes Beijing and Chengde – but we also have teachers from the Southern and Eastern parts of the country. How do you choose the right teacher for me? We will do an assessment with you before you start your course and based on this decide on a suitable teacher, study plan and study materials for you. How old are your teachers? We choose our teachers based on ability, qualification, experience, and personality not age. Therefore we have teachers of all age ranges working for us. Are your teachers male or female? We have both male and female teachers and do not differentiate between genders when hiring. However, because there tends to be more women studying Teaching Chinese as a Foreign Language at university and choose teaching as a career, we have more female than male teachers. As we have many students returning to a course at LTL, it is possible to request a specific teacher, though this is subject to his or her class schedule. If you are a first time student we will decide on the right teacher for you based on the assessment we will do with you before the course starts.